Washington, DC — The total number abortion clinics in America continues to decline, following a nationwide trend extending back to 1991. In 2015, abortion clinics closed at a rate of more than one per week with 53 abortion clinics shutting down or halting all abortion services. •	42 Surgical abortion clinics halted all abortion services. •	11 Medical abortion clinics halted all abortion services. •	16 abortion clinics halted surgeries and now offer only medication abortions. 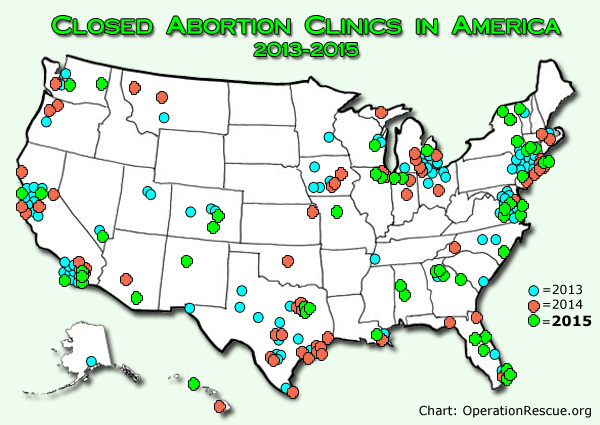 In all, 81 abortion clinics closed or reduced services in 2015. UPDATE 12/28/2015: After this report was published, Operation Rescue was informed that the Falls Church Health Center Planned Parenthood in Falls Church, Virginia, suddenly shut down on December 18, 2015, due to a lost lease. That brings the total number of surgical abortion clinics halting abortion services to 43 and the total abortion facilities that closed or halted abortion services to 54. View documentation. Currently, there are 517 surgical abortion clinics and 213 medication abortion clinics remaining active in the U.S., the lowest numbers in decades. 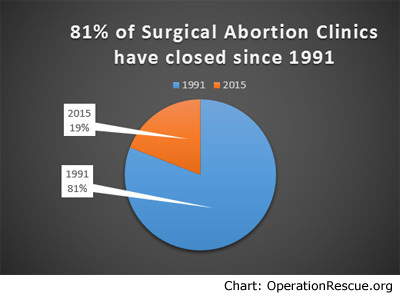 In 1991, which is considered the high water mark for the number of abortion clinics, 2,176 surgical facilities offered abortions. Since then, 81% have closed. In 2015, 21 new facilities began selling abortions. This includes 7 new surgical abortion clinics and 14 medication clinics that opened or converted from referral offices. Several other abortion facilities reopened after struggling with location issues or having been shut down by the state as unsafe. This represents a net loss for the Abortion Cartel of 9 abortion clinics nationwide and 219 since 2013. This represents bad news for the Abortion Cartel: Americans are increasingly rejecting abortion in favor of life. The reduction in abortion clinic numbers coincides with a report released by the Centers for Disease Control earlier this month, which announced that the number of induced abortions decreased to the lowest since 1990. “There is a direct correlation between the number of abortions and the number of abortion clinics. When abortion clinic close, abortion numbers decrease and lives are saved,” said Operation Rescue President Troy Newman. •	The retirement of abortionists due to advanced age and declining health. •	New state laws that have flooded state houses, especially in the wake of the Kermit Gosnell murder/illegal abortion case of 2013, which have flushed out many substandard and dangerous operators. •	Declining demand for abortions, per the CDC. •	Continued strong public pro-life support as evidenced in recent polling suppressed by the pro-abortion news media. •	Public exposure of abortion abuses by pro-life groups, including Operation Rescue, which have rightfully eroded public trust in abortion providers. Certain trends were evident in the data collected this year. Medication abortion clinics increased as surgical clinics decreased. Planned Parenthood is continuing a reorganization that involves adding money-producing medication abortions to many of its referral clinics. There is also a trend for abortion clinics that have been shuttered by state health departments to reopen as medication abortion clinics. This allows substandard abortionists to continue profiting from abortions without having to comply with licensing requirements that usually apply only to surgical facilities. An example of this are Steven Brigham’s three Maryland abortion clinics that were shut down by the state in 2014 for serious violations and a patient death. Now as medication abortion clinics, they dangerously operate outside of any regulatory authority. An emerging trend seen in a dozen clinics this year, is to drop medication abortions altogether. Over and over, Operation Rescue callers were told that the reason for dropping the abortion pill was because it was “too dangerous” or “too unreliable.” One office indicated that the failure rate was high, causing too many women to have surgical abortions to complete the process. This made providing the abortion pill not worth the trouble for that provider. Also, abortion clinics were closed because facility licenses were revoked due to inability to comply with state laws. Other abortion clinics have halted abortions temporarily while they remodel their offices to comply with new safety standards. In all, abortion safety and accountability laws are closing clinics that were too dangerous to operate in the first place. During this year’s survey Operation Rescue staff members placed over 1,000 direct calls to abortion clinics and spoke directly with abortion clinic workers. They gathered information about appointment waiting times and abortion pricing, revealing data that refutes arguments made by abortion supporters. Since the passage of Texas’ clinic safety law, known as HB2, opponents of abortion safety claim that the regulations responsible for closing half of the state’s abortion clinics have overwhelmed remaining abortion facilities. They argue that women are being forced to wait “weeks” for appointments and that this is driving up the cost of abortions. However, Operation Rescue’s meticulously gathered data tells a different story. This data is especially important because the challenge to HB2 is set to be heard by the U.S. Supreme Court next spring. 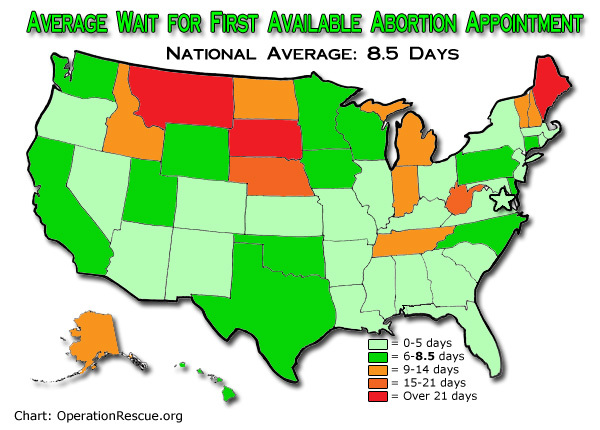 The average waiting time for abortions in the U.S. is 8.5 days. That is measured from the time a potential patient calls to schedule an appointment and the day the procedure can actually be done. In Texas, with the new safety law, the average wait time for an abortion appointment 6.5 days – a full two days under the national average! Comparing abortion appointment wait times to those for dentist appointments reveals the hype and scare tactics used by abortion supporters to oppose common-sense safety laws. While a woman might wait a little over a week for an abortion, she will wait about five weeks to see her dentist. This makes getting an abortion easier than getting a tooth filled. Furthermore, wait times at for appointments at surgical abortion facilities averaged 7.5 days, whether the procedure scheduled was surgical or medication, while a woman could expect to wait 9.4 days for an abortion appointment at a medication-only abortion clinic. Another fallacy of the Abortion Cartel that is debunked by the new data is the supposed “undue burden” of 24-72 hour abortion waiting period laws. With some exceptions, most states begin their abortion waiting periods at the time of the informed consent, which can often be when the appointment is made or an informational document is read on the internet. “Most women will blow through their waiting periods well before their scheduled abortion appointment, so this makes the ‘undue burden’ claim as phony as a three-dollar bill,” said Newman. The average cost of a first trimester surgical abortion in the U.S. is $594.74, while the average cost of a medication abortion is $568.50. Insurance and financial assistance offered by some abortion clinics can bring the price down significantly. For example, in California, it is very easy to qualify for MediCal, which will pay the total cost of the abortion. In Texas, where abortion supporters complain that the costs have become prohibitively expensive due to new regulations, surgical abortions cost an average of $578.47, which is $16.27 below the national average. Medication abortions cost $591.67 in Texas, slightly above the national average. However, there are 17 states that are more expensive than Texas for the abortion pill. One of those states is Iowa, where Planned Parenthood of the Heartland’s experimental webcam abortion process of dispensing abortion pills over an Internet teleconferencing system was supposed to increase access to poor rural women. However, it had the opposite effect. Planned Parenthood’s webcam pill clinics are located in communities with plenty of access to medical care, not small rural ones, and the average cost is a whopping $706.67 — $138.17 above the national average! 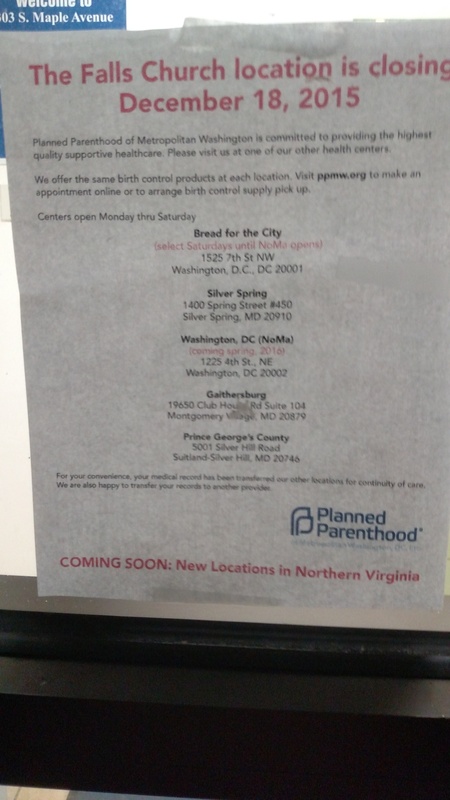 •	Planned Parenthood’s Washington, D.C. abortion facility, which was the site of regular and often significant pro-life protests over the years, shut down on June 26, 2015. It is tentatively attempting to relocate across from an elementary school, but due to slow work progress and a robust pro-life presence protesting there, it may never reopen. •	Ocala Women’s Center in Ocala, Florida, shut down within days of the South Carolina arrest of owner James Pendergraft on October 5 for drug violations and for providing illegal abortions out of his vehicle. •	Women’s Pavilion in South Bend, Indiana, surrendered its abortion facility license on November 6, 2015, after numerous and chronic violations persuaded the Health Department that it was too dangerous to operate. Owner and abortionist Ulrich Klopfer faces license revocation after pro-life groups discovered thousands of violations on reporting forms and turned him in to authorities. •	Columbia Health Center Planned Parenthood in Columbia, Missouri, was forced to halt medication abortions after its only abortionist, Colleen McNicholas, lost her dubious “refer and follow” privileges with a hospital run by Missouri University. An Interim Senate Sub-Committee investigating Planned Parenthood in response to undercover videos released by the Center for Medical Progress, discovered the illegal association. Planned Parenthood has taken its case to court in an effort to restore medication abortions in Columbia, but has yet to find an abortionist that is qualified under the law to do them. “After the release of the CMP videos, which showed Planned Parenthood’s involvement in the illegal trafficking of aborted baby organs, several states have launched investigations, which we hope will result in even further closures next year,” said Newman, who also serves as a board member for the Center for Medical Progress. A recent poll released on December 15, 2015, shows that 68% of Americans want Planned Parenthood investigations to continue. Laws have already been introduced in Missouri, Ohio, and elsewhere tightening loopholes on the disposal of human fetal remains from abortions while other legislation is expected to be introduced next year as a result of the CMP’s investigative journalism. A live count of abortion clinics in the U.S. can be found at AbortionDocs.org, along with documentation related to abortion abuses within the Abortion Cartel. Read Operation Rescue’s 2014 abortion clinic survey report. Read Operation Rescue’s 2013 abortion clinic survey report.